Musicians custom embroidered cotton handkerchief gift set of two. Musicians custom embroidered cotton handkerchief gift set of two. An instrument theme gift embroidery design to each handkerchief, both handkerchiefs are everyday use white cotton with a instrument in the corner, a clarinet is shown but this can be any instrument you wish. We can personalise the handkerchiefs with initials or a short name - just fill in the options boxes. Musicians custom embroidered cotton handkerchief gift set of two. An instrument theme gift embroidery design to each handkerchief, both handkerchiefs are everyday use white cotton with a instrument in the corner, a clarinet is shown but this can be any instrument you wish. 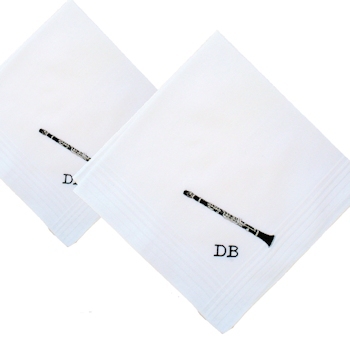 We can personalise the handkerchiefs with initials or a short name - just fill in the options boxes. If you prefer these without personalisation please email us to let us know. We offer as standard everyday cotton handkerchiefs OR if you require a more luxurious fabric we offer a pure Irish linen punch hemstitched handkerchiefs. Make a musicians day with this very attractive musical theme gift set. Please note: At Amys Gifts we do all our own embroidery work especially made to order and do our best to get all orders dispatched within 48 hours, however it may be necessary to allow a few extra days near holidays. It is always advisable to order as far in advance as you can.